This pretty Lycaenid is unique in that its early stages has 6 instars. A large number of butterflies usually have 4-5 instars in their caterpillar stage. The Long Banded Silverline is also remarkable in the wide range of host plants, across several plant families, that its caterpillars are able to feed on. Amongst the host plants are : Terminalia catappa (Combretaceae), Melastoma malabathricum (Melastomataceae), Trema tomentosa (Ulmaceae), Talipariti tiliaceum (Malvaceae), Flagellaria indica (Flagellariaceae), Psidium guayava (Myrtaceae), Thespesia populnea (Malvaceae), Acacia auriculiformis (Fabaceae). The Long Banded Silverline is very local, preferring a range of specific habitats, but it is quite widespread in distribution across Singapore. However, it cannot be said to be a very common butterfly, although where it can be found, more than a few individuals can usually be observed. 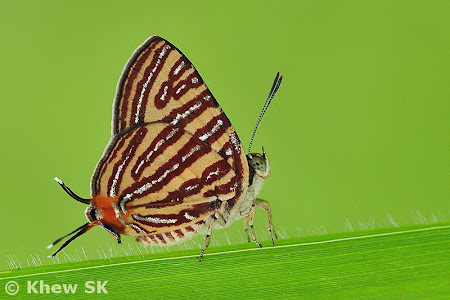 The silver-centred reddish bands across both wings give the butterfly a unique appearance, whilst its four-tailed hindwings top off a very attractive butterfly.